Recent devastating earthquakes in Haiti, Chile and China, as well as magnitude 7 plus earthquakes in Indonesia and California, might give the impression that earthquake activity is increasing. In fact, a quick look at earthquake statistics over the last twenty years shows that this is not the case. On average there are about fifteen earthquakes every year with a magnitude of 7 or greater. As with any quasi-random phenomena, the number of earthquakes each year varies slightly from this average, but in general, there are no dramatic variations. So far this year, there have been six magnitude 7+ earthquakes, in keeping with the annual rate. Earthquake activity is controlled by the motion of the Earth's tectonic plates, driven by heat generation from the decay of radioactive elements deep inside our planet. Thermodynamics requires that for more energy to come out of a system, more energy has to go in. A long term increase in earthquake activity would require an increase in the Earth's internal energy supply, which would be difficult to account for. It is true that our ability to detect and measure earthquakes has improved over the last few decades due to huge increases in the number of seismograph stations that record earthquakes. 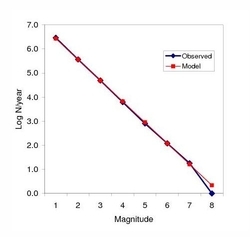 However, this mainly affects our ability to detect smaller earthquakes. Larger earthquakes occur less frequently than smaller ones. This relationship is exponential, i.e. there are ten times as many magnitude 6 or larger earthquakes in a given time period than magnitude 7 or larger earthquakes. Why it might seem there are more. There are a number of reasons why it might seem as if we are experiencing more earthquakes. 1. Earthquakes in populated places are far more noticed than the many that occur in remote regions, so when, by chance, a run of earthquakes hit population centres, it appears that the number of events has increased. Also, there are more people at risk. Population increases mean there are more people than ever in earthquake prone regions. So although the number of earthquakes remains the same the impact increases. 2. Earthquake clustering. Although long term averages are fairly constant, in any quasi-random process, you get clustering in time. Increases and decreases in seismicity rates are a natural part of this. People notice the clusters; they don't notice the gaps in between. They also forget the previous cluster! 3. Global communication. Vast improvements in global communications mean we have near instant pictures of devastating earthquakes from all around the world. This means more people are aware of earthquakes and their impact. 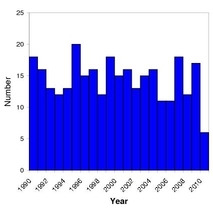 Number of earthquakes with a magnitude of 7 or greater over the last two decades. Data source National Earthquakes Information Center. Click for a larger version.